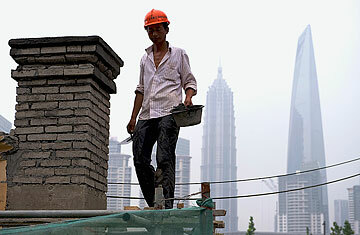 Is It the End of Cheap Labor in China? The past month in financial-land was dominated by two combustible fears: that Greece would default on its debts and plunge the euro zone into chaos; and that China would hit the brakes and bring much of global economic activity down with it. The Greek crisis has subsided for now, but China fears remain, especially as recent data from the Chinese government has shown a moderate decline in the rate of expansion. These fears are overblown. At every point in the past decade, there have been warnings of an imminent China slowdown, of an im- pending hard or soft landing that will leave many people holding worthless assets, making the mandarins in Beijing tremble and the population of China angry. Yet the idea that there might be neither a hard nor soft landing of the Chinese economy but instead no landing, that China will maintain an elevated level of growth and activity that will continue to bolster the global economic system  that possibility is dismissed as undue bullishness, excessive optimism or outright starry-eyed naiveté. To begin with, there is nothing unprecedented about a bustling society maintaining substantial growth for many years. If you had asked at the end of World War II how long the expansion of the U.S. economy would continue at a rate of 4%, 5% or 6% a year, few people would have guessed 28 years. There was a series of brief recessions, including in 1953, '58 and '60. Yet even with those, the size of the U.S. economy nearly doubled between 1950 and '60. Then the 1970s hit, and the economy reeled until a return of growth in the '80s and, save for late 1991 into 1992, most of the '90s as well. That possibility when applied to China is given short shrift. The imbalances in the Chinese system are too many, it is said, with substantial economic activity consisting of government spending on infrastructure, too little attention paid to health care, runaway property bubbles, huge wealth inequality, webs of corruption, oppressive state control of information, and now rising wages that threaten to undermine the cost advantages of China's potent export economy. The response to most of these is, "Yes, but so what?" True, there are and have been egregious property bubbles in Chinese cities, which local authorities have then deflated by raising the cash required for purchases or forbidding flipping. Significant activity is composed of state-driven infrastructure spending, yet that infrastructure is what has ultimately allowed for the rather remarkable growth. The lack of a viable health care system other than cash payments has kept the savings rate elevated, and there is food inflation in spades. None of these issues is incompatible with substantial expansion for years to come. Headline GDP numbers won't tell the real story, even if that number is 8% or 9%. The growth rate in many cities is well above that, in the range of 15% to 20%, and that is what matters for the global system. Even if those figures were to slow to the high teens, the rate of domestic consumption and appetite for commodities ranging from iron ore to oil would still be far more robust than most currently assume or than most factor into their models going forward. And with $3 trillion in reserves, Beijing is more than able to either recapitalize Chinese banks that have made bad loans or to spend strategically in case a global downturn leads to a sag in exports  as they in fact have in recent months. To be sure, beneath the surface of those glossy GDP figures, there is considerable volatility in China's economic activity, with wide swings and real variation in regions. But while the growth of China has never been neat or smooth, nothing has derailed it. What matters to the global system is whether China will sustain high levels of demand for everything from metals to energy to food to goods and services for a burgeoning domestic middle class. The view in the West is that it cannot. In fact, even in the view of many elites in China, including Premier Wen Jiabao, growth in China is imbalanced and cannot be maintained. Chinese leaders are constantly worried and ever vigilant about the risks ahead, but that does not mean those risks will come true. No one really knows what lies ahead, of course. In the face of chronic pessimism that China is headed for a fall, we would be well served to consider an opposite risk: that China doesn't slow, that it continues to plow ahead more quickly than most in the West believe possible or that many in China believe healthy. That would be the real surprise  and if the history of the U.S. and its economic emergence is any guide, it is far more likely than many of us are willing to acknowledge. See "The End of Cheap Labor in China." See pictures of the making of modern China.